SNG manufacturer, Eversat, has designed a new product aimed at journalists covering breaking news stories. 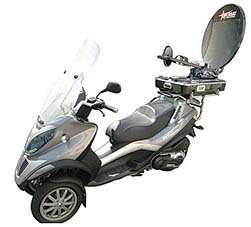 The 'BikeAway' scooter is equipped with Eversat's existing 'LightAway' SNG solution. Eversat says BikeAway gives journalists the advantage of being able to reach a breaking news event quickly - particularly in busy traffic during rush-hours - and then transmit in HD quality. 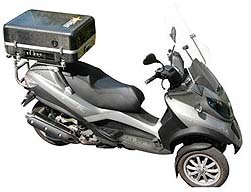 The BikeAway includes a LightAway, a set of batteries enabling 3 hours of transmission and a Video Encoder, all integrated in a powerful 400cc scooter that can be ridden by car license holders. This new type of transmission vehicle - as well as being able to deploy quickly to a story - also benefits from the LightAway advantages such as fast deployment time, ease-of-use and high bandwidth transmissions. The LightAway is an ultra-compact range of satellite suitcases compliant with IATA airline regulation. The 2-ways terminal includes a segmented antenna, automatic satellite pointing and a high-power amplifier from 5 to 200W enabling transmission between 1 and 30Mbps. The LightAway is a patented product, designed and marketed by Eversat based in Orsay, France.